I hope you had a wonderful holiday yesterday and (no matter what you did), I hope you are feeling blessed. 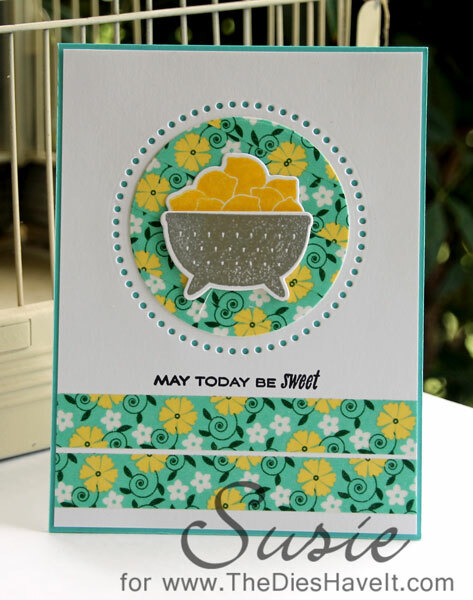 When I saw the PaperTrey Ink Bowl of Sunshine stamp set and dies, I knew I'd be ordering them. I can't wait to ink up all of them and make some more cards. I silver heat embossed the colander and in real life, it looks so shiny. I stamped the lemons in yellow and my accent was ready to go. I actually didn't use any patterned paper on this card. Washi tape did the trick for the trim and the die cut circle. I love that stuff! Have a fun day and I'll see you right back here tomorrow for another new card.